I made my Jarry Park debut at night, on a YMCA day-camp sponsored outing. The stadium felt alive, charged and vivid. The brilliant light towers, whose bulbs I tried to count, brought the grass, the warning track, and the white button-like bases into sharp relief. Night meant sophistication and excitement, an invitation to partake of the grown-up world. The evening's excellence was soon marred by an incident at my own hand. My father and I were seated in the bleachers with the other "Y" campers and their parents. There was a rally, and the crowd became animated and threw paper cups and plates in the air. I joined in, and jauntily flung aloft an empty, partially crushed soda cup (the kind with a wavy aquamarine design and waxy finish). When the hubbub had died down, a 50-ish man seated two rows behind poked me in the back with a furled umbrella. He asked that I come speak to him. "A man wants me to go to him," I said to my father, who provided a noncommittal response. I stepped over the seat in back of us and talked to the man, who was flanked by a woman of similar age. He explained that his companion had a specialized eye condition and wore very sophisticated glasses that scratched easily, and did I realize that the cup I'd just thrown had hit her? I did not. My actions, he indicated, could have caused damage not just to the woman's glasses, but to her very eye, an eye whose status, he repeated, was precarious. I said I was extremely sorry. Everybody was throwing cups in the air, so I too threw a cup in the air. Again, I was sorry. I returned to my seat. I don't think I explained this interlude to my father, it was too complicated. I threw no more cups in the air. The Expos were an innocuous summer counterpart to the legendary Montreal Canadiens. To put Jarry Park in the same category as that temple to hockey, the Montreal Forum, would, for most people, be absurd. But not for me, who attended a half-dozen games at Jarry in the mid-1970s. (3) Never having been to a non-Jarry game, I had no point of comparison, and it seemed like an ideal baseball venue to me. When fans stamped their feet, the aluminum grandstands made a terrific racket (I even thought they might have been constructed with this very purpose in mind). Another superlative feature was the black and white TV monitors mounted near the concession areas underneath the stands. (4) You could get a hot dog and not miss a thing, and if you had the misfortune to be somewhere without monitors, the pounding of feet would cue you to excitement up above. The paper cup incident belonged to the night, the handicapped-seat snafu to a weekend afternoon. I was at Jarry with my father and Bob Wood, a man who lived at a long-term care hospital in Montreal's east end, not far from Olympic Stadium (which was at that time under construction). In the 1950s, Wood had been leaning out of a Montreal streetcar, hit his head on a pole, and suffered a brain injury. He was in a wheelchair and had slurred speech, which made him difficult to understand. His presence made me uncomfortable, but my Dad looked out for him and sometimes took him on outings. We were in Jarry's jerry-rigged handicapped section, an improvised platform set off from the main seats near the opposing bullpen. My father went to drive Bob back to the hospital (or maybe they just went to the bathroom), and I remained in my seat. I was worried that once they left, I wouldn't be able to gain readmission to this special area should I need to. My father said not to worry, nobody would say anything. And really, why should they? A nine-year-old trying to scam his way into the handicapped section, which weren't even good seats, it didn't add up. They departed, and a short time later I went to get some French fries, and, mission accomplished, briskly sped up the ramp to return to my seat. "Hey, hey, hey, whoa, whoa, whoa, Monsieur," called a blue-blazered Expos usher to me, wanting to know what the heck I thought I was doing. There was no stub designating the handicapped seats, and my situation as I laid it out before Expos officialdom was complicated and barely credible: I had arrived with my father and a guy in a wheelchair, but they had left for the moment, and so currently there was no handicapped person in my party, which consisted of only me. The matter was resolved (I can't remember how, probably the usher took pity upon me), but no doubt upon my father's return I gave him an earful about the perilous position into which he'd thrown me. Even in the 1970s, baseball was a game of statistics. Digesting these numbers made learning about probabilities and percentages easy. You could correlate anecdotal evidence (this guy never seems to get a hit) with recorded data (he's batting .211). And, of course, contrary-wise, sometimes a player who appeared hopeless (just got knocked out the game in the fourth) was actually good (E.R.A. under three) but was having a bad day. I puzzled out some of these relationships by looking at the scoreboard and seeing players' averages change within the course of a game. I gradually discovered that the greater number of trials (at bats), the smaller would be the movement in a player's average in response to a hit or an out. My study of baseball cards and scorecards (I never actually scored a game, an endeavor, like Morse code, that is delicious in its old fashion manual precision) led me to understand that the Expos were mercenaries, not local boys. They hailed from such exotic far-flung locales as Culver City, California; Ewing, Kentucky; and Ponce, Puerto Rico. (10) Their hometowns were memorable, but so too were their names, notably the Pepes (Mangual and Frias), and, of course, Bombo Rivera. Pepe was a strange name, hilarious really, for a grown man, and two Pepes on one roster seemed like a wonderful coincidence. I didn't realize at the time how much of a coincidence it really was; for all I knew it was like having two Franks, Garys or Daves on the same team. A current search reveals that in the entire history of Major League Baseball, only two Pepes have ever played the game, and both were found on the Expos' 1976 roster. The Expos teams of the mid-1970s also featured two Steves, both of whose last names began with "R" (Renko and Rogers). They were pretty good, and Rogers established himself as one of the National League's top pitchers in the late 1970s and early 80s. The Steves were big guys who projected a heartland athleticism (unsurprising as they were professional ball players from the heartland). I remember Renko's batting more than his pitching; specifically, a plate appearance where he shattered his bat, launching one of the pieces onto the grass half-way between the plate and pitcher's mound. My brother, five-years-old at the time, missed it. He was likely staring at his shoe or playing with a spent drinking straw. Unbelieveable. "You missed it, Steve Renko broke his bat!" (I am tempted here to add the tag, "I exclaimed," or "I ejaculated," it was that kind of moment). Of course, a player breaking his bat is inconsequential stuff and does not form part of the box score (or even an obscure Bill Jamesian metric). Still, you don't want to miss split lumber hurtling through the air, as did my brother, an ignoramus unaware of the game's finer points. One of the Pepes (Mangual) figured in an ignominious play that occurred on a sunny weekend afternoon in 1976. I was at Jarry with my parents and brother. Gary Carter was in right field (Carter played 128 outfield games between 1974 and 1976), and Mangual in center. A ball was hit to right center and the two collided hard, falling to the grass. Mangual lay on the field for a while-I think he was eventually carried off-and Carter also left the game. The match was delayed for a good ten minutes, and there was a puzzled buzz in our section: What just happened? What injuries had the players sustained? (11) My mother was muttering about the play, and about the Expos, who lost the game by the un-major league score of 14-8. I was annoyed; I'm not sure if it was with my mother for criticizing the Expos, or with the team for putting on such a poor showing for her. The afternoon's other piece was that we'd been given two "box seats" for this Saturday afternoon game, but there were four of us. We bought two lesser tickets at the gate, and then during the game, at my Dad's urging, the two of us who were in the so-called box seats switched with the other two, further vexing my mother who wished to be left to enjoy an Expos loss in peace, without needlessly shuttling about the stadium. The next day, I read in the paper that Carter had broken his thumb on the play. It landed him on the disabled list and signaled the end of his career in the outfield (12). The incident illustrated what a completely horrendous team were the 1976 Expos. They finished the season 55-107, a stunning 46 games behind the first-place Phillies. All bad teams have at least a few decent players, and one of the competent members of the 1976 Expos was Tim Foli. Foli and I shared a first name, as well as dark hair and glasses. We were practically the same person when you got right down to it (aside from his being a professional baseball player, and me a child of slender athletic talents). A solid shortstop, Foli hit .264 that year, drove in 54 runs and collected 36 doubles. He had the nickname "Crazy Horse," and was reputed to be a hot head. He didn't look like one, and I never saw him throw a temper tantrum, but I'd read that he had once became so upset over going 0-5 in a game that he had slept on second base overnight. I couldn't get that image out of my mind: Foli in his baseball uniform, lying on second base in an empty stadium. It seemed a ridiculous and improbable thing for a grown-up to do. A few years later, rock music lore, would, if not overtake, then at least become co-equal with my love of baseball statistics and trivia (14). These two fields rarely intersected, but as a grade schooler in the mid-1970s, I was briefly able to fuse them. I didn't listen to a lot of music then, but did complement my Goofy Greats and Jackson 5 albums with snatches of songs heard on CKGM (Montreal's English-language AM top 40 station of the day). I channeled these pop songs through the Expos. To wit: I converted the line "No matter what the man said" from a 1975 Wings song to "No matter what the Mauch said." This was an homage to Gene Mauch, Expos skipper from 1969-1975. I accomplished this same Expos oriented wordplay in 1976, this time employing new Expos manager Karl Keuhl's name. I altered the lyric "Kaptain Kool and the Kongs" to "Captain Kuehl and the Kongs." "Kaptain Kool and the Kongs," I learn now from Wikipedia, was the theme from the Krofft Supershow, a kids' variety program that ran from 1976-1978. The tune was sung by a glam rock band who served as the show's hosts. I don't recall ever watching this program, although presumably I must have if I assimilated the tune. An outdoor stadium in Montreal is an invitation to meteorological hardship and disruption. On a couple of occasions, snow had to be cleared from the stands prior to opening day, and the Expos always started the season on the road to lessen the likelihood of snow or freezing temperatures at game time. I never saw any snow, but I do remember hail. I was at a game with the kid who lived next door, with whom I never developed a substantial friendship, and his father. The San Francisco Giants, a favorite of mine for their smart black and orange uniforms and California provenance, were the visiting team and it was batting helmet day. We received plastic souvenir helmets which were equipped with an adjustable head-sizer. They were uncomfortable (something pointy was always coming to the fore) and the type of thing you put on for minute or two and then take off and leave lying at your feet. Around mid-game it started to hail. Naturally, we put on our helmets. Ping ping ping bounced the stones off our plastic domes. I attended the last two games in the Expos' Jarry Park tenure, watching Nos Amours drop both ends of a doubleheader to the Phillies. That rainy afternoon was also "Fan Appreciation Day," which I thought was a big-hearted gesture on the part of the team. Between games, the grand prize, a Pontiac Le Mans (or similar North American-built auto of the day), emerged from a door in the corner of the outfield wall and crept the length of the warning track, exiting on the other side. This, a car driving on the field, was novel and a fine bit of entertainment in and of itself. There were lots of other prizes (backyard grills, dinners-for-four, carpet cleaning) that held little appeal for a ten-year-old, but nonetheless I diligently scanned my ticket to see if I was a winner. Predictably, I was not. I found it troubling that these generous gifts did not recognize a given fan's level of devotion to the cause. What if, say, a person attended one game (Fan Appreciation Day) and walked away with a car, while another took in dozens of matches year after year, but couldn't make it to Fan Appreciation Day, and so came up empty. It hardly seemed fair at all. I also questioned the viability of prizes as a promotional tool. From my viewing of the Price is Right on CFCF Channel 12, I developed a theory that giving away refrigerators kills rather than augments sales. If you saw one awarded as a prize for participating on a silly game show, you'd surely think, "Somebody got that fridge for free, why should I pay hundreds of dollars for one?" You'd have a lingering bitter feeling, and the object would be devalued in your eyes. I was playing this matter of fan appreciation over in my mind as I waited for my father to return. I believe he left at the end of the first game. Perhaps he had somewhere to be, didn't want to end my fun, and thought, "If the kid wants to sit through two games of baseball, that's fine, I'll get him later." Maybe he just went home to mow the lawn or read the paper, I don't know, but I spent a couple of hours at Jarry by myself. It seemed perfectly normal at the time, my father leaving a ten-year-old by himself at a sports stadium, but in retrospect it's odd, but then again maybe not for the 1970s. Would I leave my eldest daughter, now roughly my 1976 age, at a Pawtucket Red Sox game by herself? I am less hyper about these things than some, but no way, not a chance. And let's say she was a boy child instead of a girl, still no way. Why? Is present day Rhode Island (where I now live) any more dangerous than Montreal in the mid-1970s? Maybe, but probably not. There is the safety issue, but also the logistics piece. I can't remember how I met my Dad after the game. Did I just exit the stadium and stand on a street corner and wait for him to come lurching by in the family wagon? I note from checking the box score of that final Expos game that the second match was called on account of rain after the seventh. Did I wait in the rain, the game over early, for my father to come get me? Perhaps I used one of those relics, a pay phone, to call him. That was it for the Expos' Jarry Park period. The club's 55 wins represented the second weakest showing in franchise history (topping only their 52-win 1969 debut campaign). The season's attendance was also poor: 646,704. This was no surprise; not only was the team horrendous, but there was another event in town that summer -- the Olympics. (17) For most Montrealers, 1976 was not a year to be excited about baseball, the Expos, or Jarry Park. Tim Lehnert received an M.A. in political science from McGill, and an M.A. in English from California State University, Northridge. His short fiction has appeared in journals in the U.S. and Canada including Descant and Prairie Fire, and has written essays, features and columns that have been published in the Providence Journal, the Boston Globe, the Christian Science Monitor and elsewhere. Lehnert is the author of the 2009 book Rhode Island 101 Everything you wanted to know about Rhode Island and were going to ask anyway. You can learn more about his work at www.timlehnertonline.com. 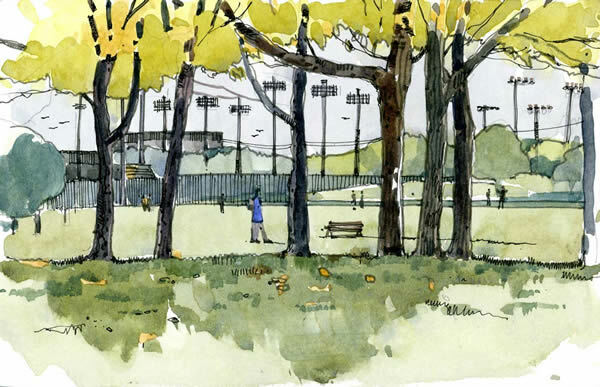 A Jarry Park Education first appeared in the literary baseball magazine Spitball. Shari Blaukopf is a Montreal graphic designer, teacher, illustrator and daily sketch blogger (www.shariblaukopf.com) as well as a correspondent with Urban Sketchers (www.urbansketchers.org). She grew up and still lives in Montreal where she continues to discover neighborhoods in her quest to find the best streets and back alleys to sketch. 1. Montreal writer Hugh Hood (1928-2000) explores the contrast between Jarry's intimacy and Olympic Stadium's concrete impersonality in "Ghosts at Jarry," a short story from his 1980 collection None Genuine Without This Signature. 2. Sluggers occasionally launched one into the pool and it would be cleared of swimmers prior to someone on the order of Willie Stargell coming to bat. Perhaps one should not exaggerate Jarry's provisional nature: According to Il étais une fois les Expos (Once upon a time, there were the Expos), Jarry Park had, at the time, MLB's largest scoreboard. I salute Jacques Doucet (long-time Expos French-language radio announcer) and Marc Robitaille for their work on this book. Subtitled Tome 1: Les années 1969-1984 , the 2009 volume checks in at almost 650 pages; Tome 2 , published in 2011, covers the 1985-2004 period and is 600 pages long. Robitaille edited another French-language baseball book, the 2003 anthology Une vue du champ gauche (A look from left field), which includes some wonderful photographs of the Expos, and of Jarry Park. Jarry Park still exists in rump form as Stade Uniprix (a professional tennis venue), and the swimming pool and surrounding municipal park remain. I attended a Eurythmics concert at some version of Jarry Park in the mid-1980s. 3. This was in the period 1974-76 to be exact. We moved to Montreal in June 1973; I'm fairly certain I did not attend a game that year, and the Expos left Jarry after the 1976 season. These markers spare me from the kind of chronological gaffe committed by Montreal-born former MLB reliever Éric Gagné, who, in an interview, recounted piling into the family car to attend games at Jarry. One problem: he was born in 1976, making such a memory improbable. 4. Keep in mind that relatively few baseball games were televised in the 1970s; just seeing pro sports on a screen still had a novelty factor. 5. Mouton's star turn was his dramatic pronunciation of back-up catcher John Boccabella's name. Mouton took great delight in theatrically stringing out the syllables Boc-ca-Bell-a , making the career .219 hitter (who played for the Expos between 1969 and 1973) sound like a feared slugger. This one articulation has become the stuff of legend, so much so that many who delight in it and remember it fondly probably never heard it themselves, but think they did. I fall under this category. 6. Another puzzling autograph I obtained during this era was from Ron Piché, Expos pitching coach in 1976, and a longtime Expos minor league instructor and employee. He leaned over the railing after a game and signed my scorecard (I didn't know who he was, but he wore an Expos jacket). In retrospect, I like this autograph; Piché was born in Verdun, Quebec (a working-class borough of Montreal), and pitched in the majors from 1960-1966. 7. Bob Bailey's 1974 card. 8. From the 1974 cards of Bob Bailey, Steve Renko and Mike Marshall (reading, horse riding and chess -- these mid-1970s Expos sound like prep school students, not professional athletes). 9. A must-read on this topic is Josh Wilker's 2010 book (and blog of the same name) Cardboard Gods . Wilker uses 1970s-era baseball cards, which he renders hilarious, tragic and luminous, as a springboard for memoir. Baseball cards, per Wilker, are not simple collectibles or disposable childhood amusements, but are totems, talismans, and means of navigating the world. 11. This was the era of the transistor radio toting super-fan who would listen to the play-by-play in the stands. At such times these individuals, who often sat by themselves, would instantly rise in status as they became possessors of valuable information not available to non-radio toters. I can't recall if such a person was present in our section that day. 12. Gary "Kid" Carter died from brain cancer on February 16, 2012 at age 57. From my current vantage point, his age at the time of his death made him more or less a contemporary (I was born in 1966, he in 1954). In 1976, however, he was a full-fledged man in my eyes as he was 22, and I a mere ten. Of course, as one might expect, today's 22-year-olds seem like baby-faced kids to me. 13. Fryman died at age 70 on February 6, 2011. Two days previous, the aforementioned Ron Piché died at age 75. 14. My love of baseball trivia may have reached its apex with the 1978 publication of "Tim and Paul's Famous Baseball Quiz." My friend Paul Olioff and I came up with about 150 baseball trivia questions, and my father prevailed upon his secretary to type them up (using a typewriter!). We stapled the sheets together, placed a tiny ad in the classified section of Baseball Digest and sold the quizzes for a dollar each. We didn't sell that many (perhaps 25 all told), and one person wrote to correct us on a number of errors. (And there were some grievous ones, early adolescents not being the most diligent of fact checkers). We refunded the man's dollar. Still, it was a lot of fun coming up with the questions, particularly those in the "True or False" section. I remember one T or F in particular: "Craig Reynolds [a short stop who played for the Pirates, Mariners and Astros from 1975-1989] was once trapped in a cave in New Mexico for two days." The answer was "false." 15. If this type of thing interests you, contact me and I will send you one for the cost of the postage. 16. This incident sounds fictional: innocent kid goes to the ball park to see his heroes and instead learns that the world is tough, cruel and unfair. Were this fiction, however, I would advance further tawdry events of the loss-of-innocence variety; perhaps on the way home from the game an uncle would stop at a whorehouse while I waited in the car; or my father, after downing several beers, would reveal during the seventh-inning stretch that he harbors a secret family elsewhere, and that I have two half-sisters. The guy taking the ball incident, is, I believe, true (surely nobody writing about the Expos of the 1970s would purposefully engage in James Frey style juicing of reality to augment readability), although I have no witnesses to back me up, nor can I employ the trusty Internet to verify the details (as I have been able to do with the rain that day, or the Carter-Mangual crash of the year previous). 17. The Olympics, or more accurately, the Olympic Stadium, turned out to be a big bust: corruption, labor problems, and most of all, a wrongheaded design, produced massive cost overruns on a stadium complex that was barely completed in time for the Games. (A crane stood beyond the outfield wall for years after the Expos moved in). Montreal's Expo 67 had been such a tremendous success that the Olympics were hard pressed to compete, even if things had gone according to plan, which they didn't. Moreover, Canada, always a Summer Games lightweight, failed to win even one gold medal. (Personally, I enjoyed seeing some of the track and field, fencing and rowing events, and the performance of the 14-year-old Romanian gymnast, Nadia Comaneci, was memorable). The Stade Olympique, whose space-aged GDR brutalism I have warmed to slightly over time, was the second Montreal white elephant to debut within the year, the other was Mirabel Airport, a massive installation located nearly an hour from downtown Montreal. It never attracted much traffic, and closed as a passenger airport in 2004. Finally, in November 1976, the Parti Québécois was elected. A key element of the PQ platform was advancing Quebec's secession from Canada. For much of Quebec's English-speaking community (who are concentrated in Montreal), this was perceived as a catastrophe, and a significant number of them, along with some high-profile businesses, quit the city for Toronto and points further west. This matter of Quebec independence, or some form thereof, is complicated, and there were referendums on it in 1980 and 1995. The matter has lost the urgency and potency it once had, but at the time, the denizens of Westmount, the majority English-speaking, mostly upper-income area of Montreal where I dwelled as a youth, were pretty freaked out by the whole scenario. So, in Montreal in 1976, there was a malaise (for some anyway) paralleling that which prevailed south of the border during its bummer of a bicentennial year. Did I, as a ten-year-old, pick up on these developments? Sure. My parents talked about such things, it was in the air, and my memories have been colored by a sense of unease surrounding the era. 18. I often wish I could have attended, as an adult or at least a teen, games from the Expos' first few years. I missed Mack Jones ("The Mayor of Jonesville"), Rusty Staub ("Le Grand Orange") in his first go-round with the team, Bill Stoneman's two no-hitters, and such oddities as Ron Hunt's record-setting 50 times hit-by-pitch in the 1971 season. Jarry was also legendary in its early days for what went on in the stands: The man who did furious jigs up and down the aisles, the mini-skirts, the party atmosphere.